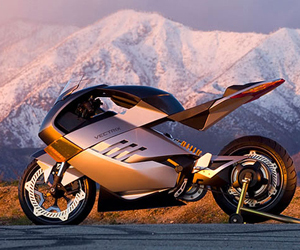 Take a look at this marvelous and unique design of the Vectrix Electric Superbike! Projected by designers Erik Holmen and Rob Brady, the super cool motorcycle features state-of-the-art clean technology which means it is powered by a motor and batteries instead of an engine, fuel tank etc. A magnificent looking, two-wheel vehicle of the future which is eco-friendly!